Straight from the heart: Oh! When I Saw Her..! A very simple question but give an honest answer – close your eyes, think and tell me, when was the last time you looked at moon? Sounds silly? Well, this was the question one of my friends asked me when I went to USA in 2008. I was zapped. I thought for a while and I realized I didn’t even know when I looked at the moon last time! Damn! It’s right above my head, every single night shining in fully glory and I just fail to notice! This is again exactly the same thought I had when during night safari, our jeep stopped on a narrow road at midnight right under the dark sky. There are moments which are impossible to capture through words. Either you need to be present at that moment or you need to be Shakespeare to describe it in words! Though I am not Shakespeare (and even my name says so – after all, there is a lot in a name! ), I was fortunate to be present at that particular moment, to witness a marvel which I will cherish and treasure for the rest of my life! Now either you want to scream or even better, you don’t even want to respond to someone when he is trying to wake you up at 4.30am! What makes it even worse? You just slept at 3am! But not today :-) I took few moments to gather my senses (what else do you expect after a hectic day and one and half hours of sleep? ), looked around and jumped out of my bed to get ready. After all, we were going for early morning safari, which was the best chance to spot the king of the jungle! BANG BANG! Who wants to miss that! By 6am, we were outside the main gate of the core jungle waiting for our turn to enter inside. By 6.15am, we were inside the jungle. We drove a bit further and found bunch of jeeps were stopped on the road and folks inside these jeeps were standing and looking at somewhere far in the jungle. WOOOO HOOO!! Adrenalin started pumping because someone from the other jeep whispered – “TIGER”! Oh My My!! Hey Mr. driver, take our jeeps little backward to avoid those trees, let us pull out our camera, wide open our eyes and.. ah..we couldn’t spot the tiger :-( LOL.. Never mind.. It’s just that our eyes are not so used to spotting wildlife.. It took few more seconds and then… and then… and then… OH YEAH BABY! We spotted THE KING!! Oh wait, not a king but a QUEEN with two little prince / princess :-)!! Oh! I saw her! 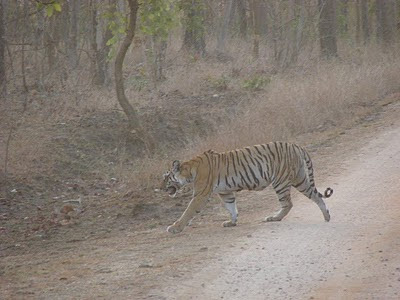 The famous Tigress of Pench along with her two cubs!! You need not visit Buckingham palace or go to Mysore palace to feel what is royalty. All you need to do is just spot a tiger in full glory in wilds! Nothing defines royalty, pride and confidence better than a ROYAL TIGER! What a royal walk! She moved with such elegance and pride with who-cares-for-your-presense attitude written all over her! She started walking in the wild from the right hand side of our jeep, crossed the road right in front of us and slowly vanished in the wild on left hand side of our jeep. We traced her with our eyes till the farthest possible distance and then just couldn’t control our joy! BINGO! Our trip was OVER! After all, that’s all we wanted to see! WOO HOO! It took some time to sink in this wonderful sight as there was pin drop silence inside the jeep for quite a while :-). However, the god of the jungle (and I don’t know who he is) was very happy and kind on that day as he gave us chance to see some amazing sights like – an eagle sitting on a branch holding his prize possession of a snake that he had just killed! Followed by a very rare sight of a peck of wild dogs! Oh I didn’t even bother counting umpteen deer, monkeys, colorful birds, insects, rabbits and god knows what else! But I must remember this dancing peacock :-) Though not sure if he was successful in attracting a female (oh please let me know Mr. peacock.. I need some lessons from you if you had succeeded.. or else, we are in the same boat! ), I am sure he provided an amazing view which we clicked in our camera and captured in our mind though human viewfinder. Some of my friends in other jeep were even luckier as they got a chance to witness a tiger couple playing watersports in a pond! Though they had to sit in scorching heat for an hour waiting for his royal highness and her queen to arrive, it was worth every single moment of wait. Evening safari was another attempt at spotting a tiger but I guess we all were content by that time. Nah, we didn’t have enough of the jungle – it’s just that we had satisfied our biggest wish of spotting the BIG CAT! It was 6pm and time for us to leave Pench to get back to Nagpur to board a bus to Hyderabad. Though the Volvo bus had a speaker right about my seat with loudest possible volume, I was dead tired to even bother about it. I rested in peace till someone woke me up at the border of Hyderabad. That ended a wonderful, memorable trip to relatively unknown area of “Incredible !ndia”. We are bestowed with such beautiful landscapes and god’s wonders that even a lifetime won’t be enough to cover it. However, I will – as much as I can! LOL... even Bin Laden started hiding identity under a burqa! This post is the most descriptive among the 3 ..